Think of ParkMyCloud as a programmable on/off switch for your AWS, Azure, and Google Cloud Platform instances – it simply turns them off when you do not need them. Renting infrastructure on demand is the most disruptive trend in IT in decades. In 2016, enterprises spent $23B on public cloud IaaS services. By 2020, that figure is expected to reach $65B. The public cloud is now used like a utility, and like any utility, there is waste. Who's responsible for optimizing the infrastructure and reducing wasted expenses? It’s DevOps. 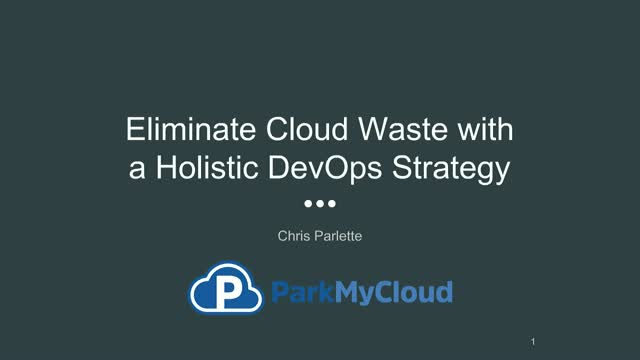 Join Chris to learn why you should include continuous cost optimization in your DevOps processes. Automate cost control, reduce your cloud expenses, and make your life easier.